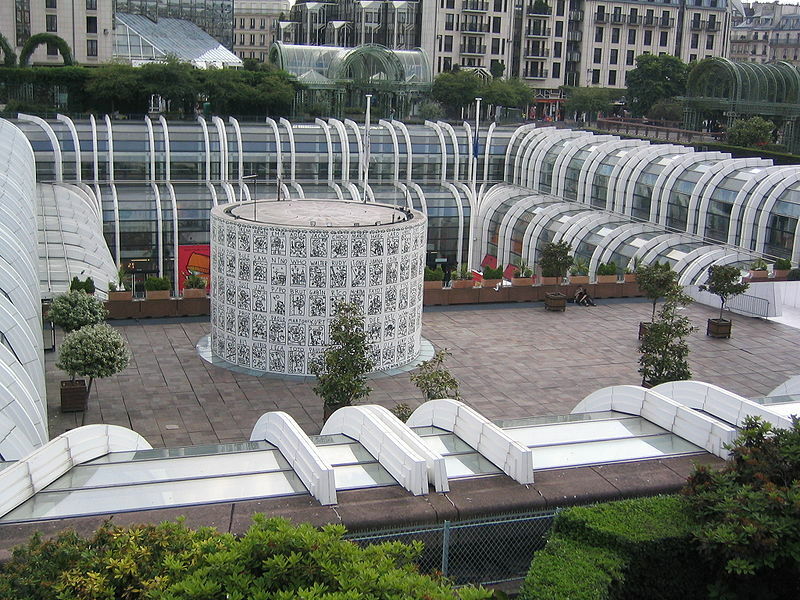 Châtelet-Les Halles is not only located at the very geographic center of Paris, it is also the transit hub of the city. 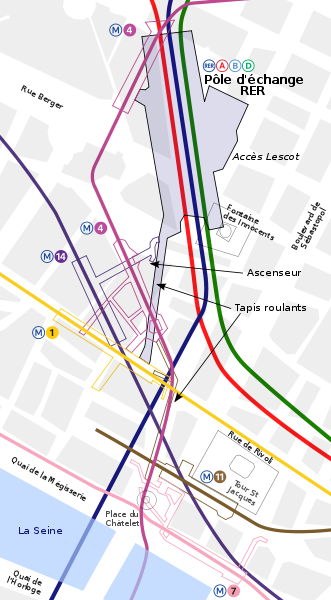 It is actually a complex of two Métro stations (Châtelet and Les Halles) and a pôle d’échange, or central exchange station, for the RER (Réseau Express Régional or Regional Express Network, Paris’s commuter light rail system). The RER station services three of Paris’s 5 RER lines: A, B, and D. Métro station Châtelet services 5 of Paris’s 16 Métro lines: 1, 4, 7, 11, and 14. Métro station Les Halles services the 4 line. The first notable thing about Châtelet-Les Halles is that it’s huge! The southern end of the RER station connects to the Châtelet Métro station and the northern end connects to the Les Halles Métro station. The walking distance from Châtelet to Les Halles is almost half a mile (750 meters)—a distance 50% longer than the average distance between stations in the Paris Métro system! Thankfully the transfer is facilitated at one point by a nice, long people-moving conveyor belt … or you can just take the 4 line and save the shoe leather. 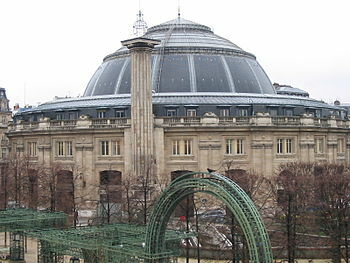 The second notable thing about Châtelet-Les Halles is that it is the busiest underground transit station in the world. Each weekday, Châtelet-Les Halles hosts about 750,000 travelers (more than the average weekday traffic in the entire Washington, DC Metro). During rush hour, 120 trains arrive in and depart from Châtelet-Les Halles each hour! That’s a lot of people scurrying here and there. No wonder Châtelet-Les Halles is, in my opinion, the most overwhelming and disorienting Métro station in Paris. So, the question that I initially set out to answer: why is it called Châtelet-Les Halles? The Châtelet station is named after Place du Châtelet, a public square on the right bank of the Seine near the point where the Pont au Change crosses the river from the Île de la Cité. The square marks the former site of the Grand Châtelet, which was demolished by Napoléon I between 1802 and 1810. The word châtelet is an Old French term referring to a small castle or stronghold usually guarding a bridge or other approach to a city. 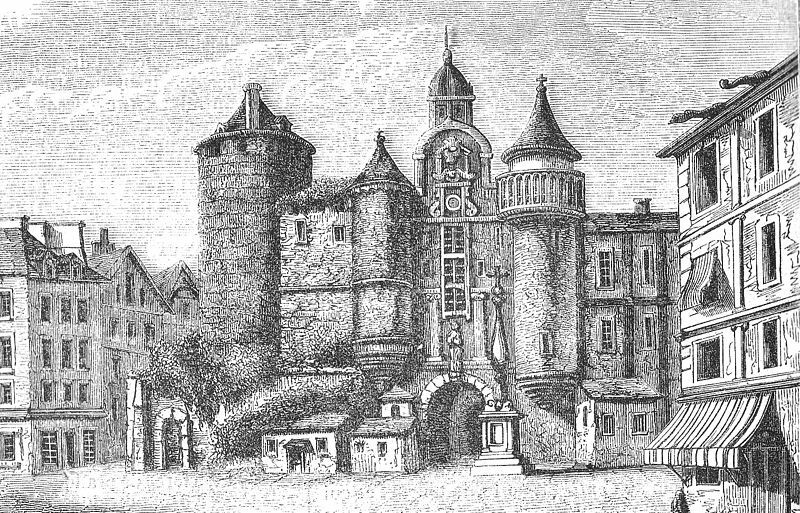 The Grand Châtelet was one such fortress. The Grand Châtelet was built in 1130 on the order of Louis VI. It was constructed on the site of a wooden tower originally built in 870 to defend one of the points of entry into the city of Paris: the Grand Pont (later replaced by the Pont au Change). (At that time, the city proper was located entirely on the Île de la Cité.) The fortress was called the Grand Châtelet to differentiate it from the Petit Châtelet that guarded the Petit Pont on the left bank of the Seine near Notre Dame. Beginning in 1190, the Grand Châtelet became the headquarters of the Prévôt de Paris, whose duties were to administer the King’s justice in the city. Over the years, the Grand Châtelet was refurbished numerous times, the final renovations in 1684 under Louis XIV effectively rebuilding the fortress in its entirety. Okay, so Les Halles weren’t all slaughterhouses, but at the end of the eighteenth century, the neighborhood certainly had its fair share. 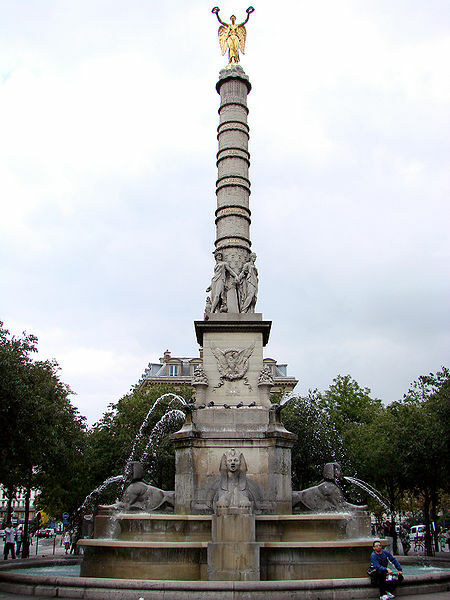 The area where Les Halles is now located has been a commercial district for the city of Paris since the 12th Century. In 1137, Louis VII ordered the creation of a large marketplace outside the walls of Paris that would become a prosperous commercial exchange for the region. The existing marketplace was moved from La Place de Grève (now Hôtel de Ville—Paris’s City Hall) to the area now known as Les Halles, which was then called Les Champeaux—from Old French referring to fields (“les champs“). In 1183, Philippe II Auguste had the marketplace enlarged and had shelters constructed for the merchants to protect their wares—these becoming the first “halles,” a French word of Germanic origin meaning “hall” or “foyer.” Eventually, the marketplace was expanded from its original meat, bread, and wine focus to encompass the markets for all sorts of goods including other foodstuffs, shoes, textiles, and haberdashery, with each type of merchandise being housed in a separate pavilion or halle. Under François I in the 16th century, the marketplace was reorganized and renovated once again. 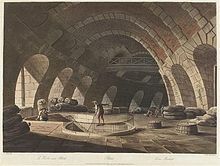 In 1763, the great Halle aux blés was constructed at the western end of the quarter to serve as a wheat market and storehouse. The building is now the Bourse de Commerce, or the Chamber of Commerce of Paris. At the other end of the quarter, at the outset of the French Revolution in 1789, the Cemetery of the Innocents was removed and the land was transformed into a fruit, flower, and vegetable market. This area is now La Place des Innocents, a public square. In 1808, Napoléon I undertook a reorganization of all of the covered markets and issued new regulations concerning the slaughterhouses there. Between the mid-nineteenth century and 1870, extensive renovations replaced all of the existing covered markets and replaced them with ten large covered pavilions. Two more such pavilions were added in 1936. Finally, in the 1960s, the Paris government decided to move the markets from Les Halles to the suburbs of Rungis and La Villette despite popular resistance. The 1970s and 1980s witnessed the demolition of the pavilions and their replacement with a new commercial forum and vast subterranean shopping mall that can only be described as an eyesore typical of that architectural era. In 2004, a new project—currently underway—was approved to renovate the area once again. And really, it’s none too soon … just look at that ugly mess. I remember getting horribly, horribly lost with Anne, walking with from our hotel in Les Marais to Printemps. We walked through Les Halles, and were appalled. I think we asked for directions from someone, which is how we ended up in Les Halles. Have you read “Paris: A Biography of a City” by Colin Jones? Wonderful book about the history of Paris from pre-Roman times to the 1980’s. I haven’t read that, but I should certainly check it out. My first semester here I was enrolled in a seminar on the history of France that started with the Gauls and ended with the 1970s or 1980s. Fascinating, fascinating stories. I fell in love with French history, especially the little known stuff. Thanks for the recommendation!